It’s not uncommon to find quack doctors contradicting themselves on the internet these days, giving medical advice that directly contradicts facts about products that they’re selling for a profit. Case in point: Dr. Mark Hyman and his guidance on toothpaste. Oh dear. Is that glycerin I see listed there? Didn’t Hyman just post an article by a dentist telling us that glycerin has no place in our mouth?1,2 Why yes, he did! The toothpaste Hyman is hawking can, according to his own reference material, dangerously alter the microbiome of your mouth, strip its natural mucosa, and alter the body’s ability to naturally fight cavities. 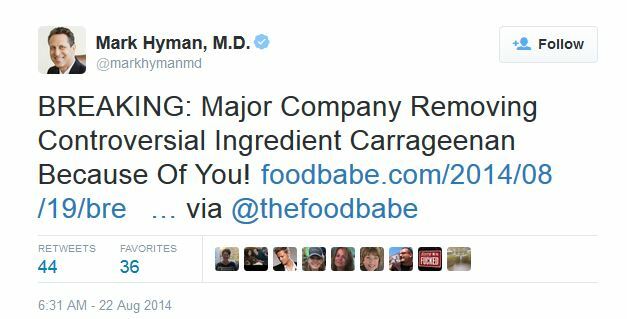 Hyman is congratulating our old friend, the Food Babe (Vani Hari) on her purported part in the removal of the “controversial” (hint: it really isn’t) ingredient carrageenan from a certain company’s products. Yet here we find it in the toothpaste being sold by Dr. Hyman, who wrote the foreword to Food Babe’s book, The Food Babe Way. Hyman hails Hari as a hero,5 but doesn’t think twice about earning money from a product containing an ingredient she falsely links to cancer.6 He can’t feign ignorance–he tweeted her congratulations on its removal! This “you scratch my back, I’ll scratch yours” theme runs rampant among the woomeisters currently pushing their pseudoscience on the web these days. Hyman helps Burhenne and Hari with links and referrals, and they do the same for him7,8–but none of them seem aware of the fact that they’re contradicting each other (and themselves). Or, as long as the money rolls in, maybe they don’t care. PerioBiotic, Facebook, Dr. Mark Hyman screen snapshots are used in accordance with Title 17 U.S.C. Section 107, commonly known as “fair use law”. This material is distributed without profit with the intent to provide commentary, review, education, parody, and increase public health knowledge. This entry was posted in Alternative Medicines, Health, Skepticism and tagged bad science, beauty, carrageenan, dr hyman, food babe, glycerin, mark burhenne, mark hyman, toothpaste by Mark Aaron Alsip. Bookmark the permalink. You’re on a roll with these posts! I’m enjoying reading them and take great delight in your investigative prowess! They’re always well written and informative. I sometimes see Mark’s articles on FB linked from very popular skeptical sites. I hope he doesn’t stop! While your article offers fair criticisms of the behavior of these doctors and ‘health coaches’, I was hoping to see a debunking of bad science rather than an opinion on the ethics of how others are behaving. Someone is claiming glycerin inhibits the remineralization of teeth. At no point in time was this claim debunked. It’s become more apparent through information exchange among both patients and clinicians that the capacity to remineralize teeth, even arrest decay and remineralize the affected tooth structure (even beyond the incipient stage), is quite remarkable. What was professed as impossible is known to be otherwise, yet is so poorly understood clinicians have no clear path to implementing it with reliability. This is, in part, because remineralization of caries seems to be influenced by factors dentists have, as a profession, largely ignored; it is a treatment path they have spent little time exploring. While we know it happens, we do not understand why it happens, thus people grasp as the most tentative hypotheses in trying to fight a disease that the dental profession’s answer to patient is ‘if clinpro and flouride varnish does not work, we’re just going to drill until you are edentulous’. 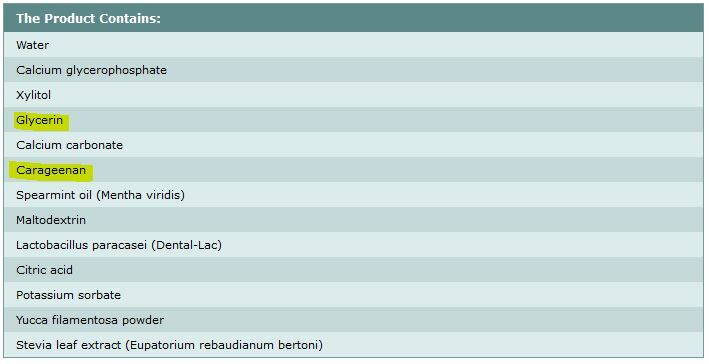 Does glycerin and other common toothpaste additives inhibit remineralization? I don’t know. I haven’t found any studies directly assessing this. It would be an easy study to perform. Thanks for reading and commenting. There is, as you found, no literature studying or debunking this claim. There isn’t even any literature supporting it. Debunking nothing is problematic 🤓. I did reach out to dentists who said it was the strangest thing they’d ever heard. Given the high water solubility of glycerin, it should simply be spit right out. So a debunking wasn’t in the cards, and I do apologize. I would just say that I wasn’t so much calling out ethical behavior as I was asking the very legit question, “if you claim glycerin is so bad for teeth why are you selling it for teeth?” I view this as bad science, in the same way I would question a scientist who, say, warns of flammable gases yet sells flasks of sulphuric acid and instructs customers the dump in magnesium shavings during a candlelight dinner.